Where did you get one at? I was at an auction this past weekend and picked up a case of 7.62x39 ammo. I guess I got up to early because I thought it was .308 ammo....needless to say 7.62x51 is what I wanted:( So now I have 1000 rounds of ammo that I have no use for. I figure I can either find a cheap gun to shoot it through, then resell it, or just sell the ammo. I got mine to use as a plinker - a 22lr substitute. The ammo was the same price when purchased in case lots. I didn't want to reload for it so the cheapest berdan primed cases were fine for my use. When I found out how accurate one of my guns was then I decided to use it enough to make it pay. I still don't chase brass to reload but I have a case and some ammo stored. It is a fun gun to shoot when you can load a full clip and fire it but the ranges around here don't let you do that. I have to load a single round at a time. It really isn't good enough to enjoy shooting at targets but it is a lot of fun shooting gongs at 100 yards in rapid fire. So the point right now most of us are making is that the SKS is an overall good rifle up to 100 yards. and you can have a great time just shooting off rounds downrange. anybody care to add anything else? It so simple to work on that a trained monkey can make one run, and go bang EVERY TIME!! Or something is VERY wrong. A perfect rifle for a dirt clod safari or a Go-To-Heck SportUtilityRifle. And start chasing brass!!! Decent 7.62X39 is not as easy to find as you might think. I am in the market for some actually. As I have a chamber adapter for my MAS36 to use this and I only have about 40 cases, Remington with the small rifle primer but hey they are reloadable without the hassle of a special tool. The ten round magazine is not really a hamper as the 20 and 30 add ALOT of weight and make prone shooting nearly impossible but are great for shooting at dirt clods, or basically burning off excess ammunition. It is not a .30-30Win but out to about 150yards give or take depending on conditions and rifle and user; it will do about anything that needs to be done on most mid-sized game animals. yep thats what i am talking about! good comment! I have one of the Yugo M59/66 (W/grenade launcher, etc. ), after replacing the front sight assy. and replacing the GL with an L1A1 Flash/Compensator and finding a way to solidly tie down the receiver cover, fit and lengthen the stock, I have a fine shooting rifle. On a good day when my eyes decide to work and the weather cooperates, the 4x32 scope will keep em under an inch at 200 yds using the the Wolf 154gr Soft tip ammo from a bi-pod or rest. Before I forget, I bought my SKS as an "unissued" parts gun at a gun show, it was just like new (except not all the numbers match, oh well). Some of the examples I've seen at certain chain stores look more like "battlefield pickups" and are somewhat "questionable" IMHO. Any ways, I am a real fan of the SKS and what it can do when cared for and in the hands of a good shooter! Welcome to the HuntingNut MGKelly Sit and stay a while. There's a great group of guys here . Thanks for the welcome, any time you got a bunch of guy...er (I know of more than just a few women who are excellent shooters) folks who are serious about their craft and dont mind answering questions; you've got a great group! I like the 7.62x39 stuff, mainly the SKS and of course the required AK clone (WASR 10 in this case). These rifles shoot quite well if you're in to adding a little elbow grease and some range time. Oh, yeah the prices are with in my range of affordability ! So if anyone has any questions about this particular flavor of firearms, I'm happy to give any help I can, and if I can't I'll try and find someone who can. 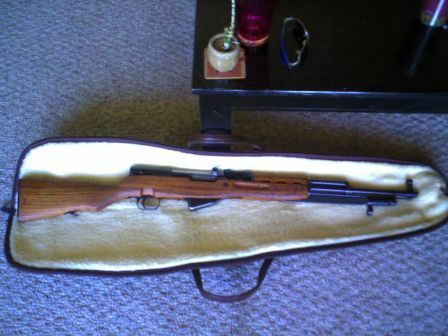 I bought an SKS years ago, new in the box imported from the Norinco factory. Or rather, my brother was buying them from an importer. I picked through dozens and dozens of them until I found one that had beautiful wood grain, which is almost impossible to get. I think they were $125 each back then, with used ones were going for about $95 to $100 each. I think that this was during the time before Clinton wanted to ban them. I'm not sure how easy they are to get, or even if you can get new one's anymore. From two years of Viet Nam experience, I can tell you that they're a pretty good rifle. You can beat them up and they'll still shoot. I have what I call a ringer set up in a field about 200 yards from my house. It's a bipod with an 8 inch square- one inch thick steel plate, hung by two heavy pieces of chain. Every so often I'll step out on the back poarch and ring that thing a few times. I don't know if I just got a good one, but it will shoot. It'll give a coyote hell. The shells are cheap. I buy imported shells for about the same price, or cheaper in some cases than 22 magnum shells. SKS is the same with the AK - 47 even when you put it through mud, water, and dirt it will still fire. Unlike the expensive M4a1 it easily breaks down and jam i know this for a fact because i have one. I'm an SKS expert, honest! There are more variants of this battle rifle than you can shake a stick at. Mine is a 1959 Yugo M59, not the "Big 5 grenade launcher special", but an as issued, 100% orrginal, all the #'s match, battle rifle. The bore is black, heavily pitted, and it ring gongs w/ my lousy eyesight at 300y w/ the well regulated sights. It's all milled too, no stamped stuff. It's a true battle rifle in as issued condition. Still stinks like cosmoliene too. It has a ton of petina and rack marks and such and it's never been reconditioned. The Yugo's were the best made, IMHO. Excellent steel, blueing and good machine work. Ask me anything you want to know about the Simonov. *** If you get one- take the bolt, strip it down, clean it spotless and put it back together dry. NEVER oil the pin area of an SKS bolt. Keep (very little) lube in the action on the rails, never allow it to get anywhere near the pin. The pin should rattle in the bolt block. Keep yours as issued, if it's a battle rifle. They really are a cool piece of military history. Sporterizing the non-battle rifles is fine, but don't butcher a military rifle, please! I've seen Tula made ones completely Buh-buh'd up and it made me wanna cry! That is a nice one!! !I did some work on mine, nothing major just a Monte Carlo style synthetic stock and a scope mount on top that can come off in a second. This one really does look like a original Russian made Ziminova!!! From the picture I would have said Chi-Comm or Comm Bloc!!! I still have as far as I know the original stock minus a hand guard. Mine is a Norinco pre-ban with a threaded barrel and milled trigger group and receiver. Labanau, NY was the location of the importer. I am told this a rare importer, have no clue myself. Oh I also put on a flash supressor/muzzle break. Again I can make this all original in about ten minutes!!! What he said about the bolt and firing pin is critical!!!! But you do need to put a light coating of lube on, that is why I like Mili-Tec 1!!! And if you should happen to get a slam fire, HANG ONT OIT IN A SAFE DIRECTION AND ENJOY THE RIDE!!!! Then tear it apart and figure out what is going on. Or if you are using reloads, use the military primers as they are harder(thincker) than standard primer. Had a relative's Garand "double" because it was reloaded with "normal" primers. Good rifle!!! an old post but I will add a caution for you 7.62x39 users the china sport ammo is cheap but beware we have had cases that have pieces of case folded back inside that have been blown forwards when fired... the pressure must have been a little high as this was happening. Grant, if you need some stripper clips for the SKS to load them, let me know. I will gladly send you about 30 0f them. I have over 100 lying around here. Good one Elvis, that's why I reload that round. Well and the fact that cheap ammo seems to be dirty as heck too. Leaves lots of deposits in your barrel and can mess up a firing pin too.